Two very different semi-finals, but only one ending – heartbreak for two teams and joy for the others. It was a familiar story for England in the last match of the day as they lost on shoot-out to Germany after a scintillating and fast-paced match. The game had the spectators on the edge of their seats and any neutral in the crowd would have been hard pressed to be anything but fascinated and enthralled by the hockey on display. The first semi-final was a slightly tamer affair. The Netherlands beat a subdued Ireland by a solitary goal to book their places in the Unibet EuroHockey Championship final. 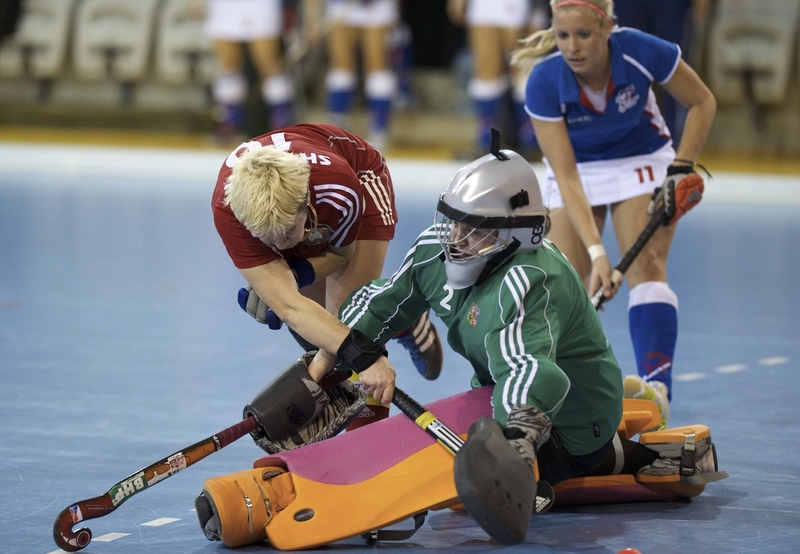 The Green Machine were forced into a defensive position for much of the game and the Netherlands were content to sit on a lead and keep the pressure on the Irish defence. Their reward is a final against a German side brimming with confidence at retaining their title. In the classification matches, France and Belgium were able to put some clear water between themselves and relegation as they both recorded victories, although it took Belgium until the last quarter to register a goal against a beleaguered but resilient Spanish defence. “We now have a year to close the gap between us and the top teams,” said Jordi Carrera, as the defender acknowledged that the Spain team had possibly let thoughts of their inclusion in the 2016 Olympics cloud their performance in this match. The defeat of Ireland earlier in the day had confirmed Spain’s berth at Rio. Simon Martin-Brisac of France said: “Winning was the most important thing from this game but we didn’t play great. We were better against Belgium and Ireland. At this level, sometimes it’s just a question of winning so we are happy. “We hope it will be like a final against Spain for survival. We have a lot of injuries with Guillaume Deront already out and one or two other little injuries so we have to play with 17 but hope to do a good match.